A few years ago, I read that search engine optimization (SEO) wasn’t just a way to make sure Google and Yahoo! can find your website. iTunes is also a search engine, so if you had a podcast, you know where your content needed to be listed. Similarly, YouTube is a search engine. Are you optimizing your marketing efforts there? You have two opportunities here: leverage existing channels and publish your own. 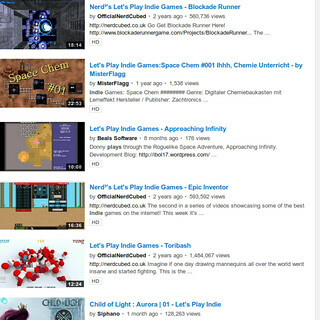 There are quite a few channels focused on games, and some of these channels have dedicated viewers. In the article Advertising Through YouTubers, Kevin Harwood makes the case for introducing your game through one of these influential channels by endorsing them so they review and play your game for everyone to see. It would be completely within reason to pay $250 per video made and commission four 20-minute game play videos. No this is not a “get rich quick article”. I’m simply showing the ROI on a basic initiative like this. Now, this article was not published years ago. The race to the bottom in game pricing has already occurred. Most indies are not selling their game for $30 on Steam, and I’m sure a 0.5% conversion is one of those things that doesn’t just happen. Still, I don’t think the basic principle is off. YouTube videos are bite-sized content that your prospective customers are actively searching for. The same may or may not be said for your game’s website. If you can do more than merely send a link to a channel’s owner, you have a better chance of your game getting featured and in a positive light. Harwood suggests incentives to encourage the reviewer to play the game with a goal of achieving some level. It would be terrible if your intricate strategy game was reviewed by someone who didn’t seem very invested in trying and misunderstood some key aspect of it. Saying something like “If your playthrough gets past the Cow Level, you can get three free copies of the game to giveaway to your viewers” means that your exciting and awe-inspiring Cow Level has a better chance of being featured than if you merely hope the reviewer gets that far and discovers it. Obviously you can’t control how other people will enjoy your game, and if you pay to get your game endorsed, there are even laws governing disclosure. See the FTC’s 2013 PDF dotcom Disclosures: How to Make Effective Disclosures in Digital Advertising. The goal isn’t to deceive people into thinking that an influential reviewer loves your game. The goal is for the influential reviewer to give your game a fair chance, and you want to put in some work to make sure that your game is shown in the best light. If you do nothing but spam emails to these video reviewers, having no relationship with them in the first place, you are just another faceless game developer. It is random chance if your game is reviewed in the first place, and if it is, who knows how the reviewer will play it. Imagine if a game such as Mario Kart 8 was reviewed by someone who didn’t know that you can use the items that you pick up on the track. That is, this person picks up banana peels, or mushrooms, or a boomarang plant, but didn’t know to press the button that actually makes use of them. One of the key features of the game is completely ignored in the review, and suddenly the game looks somewhat flawed and confusing. So no, getting your game featured on popular YouTube channels is not a guaranteed way to make your game popular. You still have work to do, and Harwood has some creative ideas for making it work out well for everyone involved. If, on the other hand, you want to make your own videos to similarly take advantage of YouTube as a search engine, there is a separate article on how to make videos for games by Alconost co-founder Kirill Kliushkin you would want to see. My favorite piece of insight was how scripts are timed so that voiceovers are matched to on-screen events. I also really appreciate how the entire process is purpose-driven. The first question they ask is “Why do you need a video?” and the process flows from the answer. Kliushkin covers teasers vs trailers vs in-game video intros, scripting and storyboards, and the importance of professional-quality voiceovers, among many other topics. Even if you plan on hiring someone else to make the videos for you, this article seems like a good primer on the basic things you need to keep in mind to create the right video for your marketing needs.